I've been looking to make something like this for a while now but have not come up with an idea of how to pull it off. I am a fan of flight/space simulators and have a Saitek X52 joystick (which is a two piece joystick for those who aren't familiar). I noticed a picture of the Playseat Office Chair with it's dual arm attachments and it seemed like the perfect compliment to my joystick. The issue is, the seats are horrendously expensive and way way outside my budget. 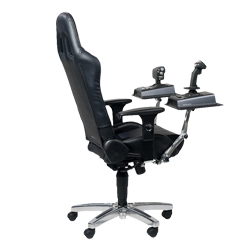 I was wondering if anyone had any ideas how I might be able to pull off a conversion of my current office chair to add arms like the playseat has. But seriously, you can make any sort of extensions from bent metal tubing, pvc pipe parts, wood, all glued, bolted, nailed, or screwed together. Your ordinary office chair seat bottom is usually a flat piece of metal or plywood or plastic that you can drill through for some mounting holes, even tie-wrap the arm extension. You can add platforms for the controllers. Good luck.